Kauai is known as Hawaii’s island of discovery. Its enchanting unending coasts and blue waters, its surreal waterfall and unmatched sunsets are your ticket to untold stories, exotic memories and new adventures. Cruises to Hawaii give you paradise and convenience all on one ship. Hawaiian cruises offer an easy and affordable way for you to explore where land meets sea. 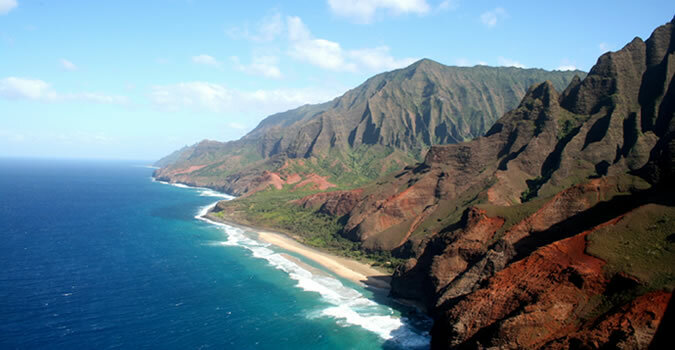 Kauai is the fourth largest Hawaiian island. From its rugged cliff edges and spire-topped mountain to its lush valleys and dividing rivers, Kauai is a tropical play land and a Mecca for gardens, sea and anything else you can dream up. Are you feeling daring and maybe even a bit crazy? Kauai is your island then: cliff jump off its chain of cliffs, zipline through its deep valleys littered in colors and nature. Looking for something a little more a low key? Then throw on your hiking shoes or rent some water gear and boat, kayak or snorkel and enjoy the island’s many bodies of water: Napali Coast, the Wailua River or the Poipu beach. Better yet, put life on pause grab a good book and post-up on its beaches and soak up the sun. It’s your island; do what you want. HawaiiCruises.travel is your coastal ticket to Kauai. Since 1995, we’ve been cruising the sea, specializing in discounted cruise vacations. Our competitive rates, Hawaii-smart staff and five-star customer service are the perfect way to cruise to Hawaii’s northernmost and oldest island — Kauai. Packages for a Hawaiian cruise are available on Norwegian Cruise Line (NCL), Royal Caribbean, Celebrity Cruises and Carnival Cruise Line and other major cruise lines. It’s our job to worry, not yours; so let us help you save money and stay in the budget — joy of the islands (wink). Book your Hawaii cruise today by surfing our website or call 1-877-721-8085 for discounted rates plus free onboard credits. We’ll make sure your Hawaiian adventure to Kauai is perfect.